Richard Rothman began what would become his latest book in a tent in northern California, with a 4×5 camera and the intention to photograph old-growth redwood trees. Redwood Saw, out on October 14th, is the story of Rothman’s five years photographing that forest and Crescent City, the depressed town that was cut out from it a century and a half ago. 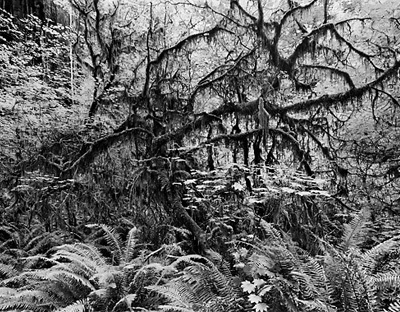 In ponderous black and white, Rothman juxtaposes the grandeur of the ancient trees with the harsh reality of a logging and fishing town that no longer has the natural resources to log or fish. The forest photographs are arresting in their depth; Rothman consistently finds the junction at which branches, trunks, leaves, and stalks from all different plant species meet, forming a gorgeously textured tableau that speaks of the rhythms of the forest. By contrast, the images of Crescent City are divided between shots of dilapidated architecture and portraits of citizens in their homes and workplaces. The town is portrayed in a stark, almost stylized manner, as if by draining the area’s forests the logging industry managed to visibly bleed dry its own life force. If these pictures are a ruthless return to the human scale, we get some reprieve in the photos where nature and society meet. Where locals stand at the edge of the undergrowth or charred tree stumps stretch into the distance, Rothman succeeds so completely at finding a harmony and balance in the landscape that even in shots of what is undoubtedly a tragedy—a ruined forest of stumps—the regality of the natural world remains.